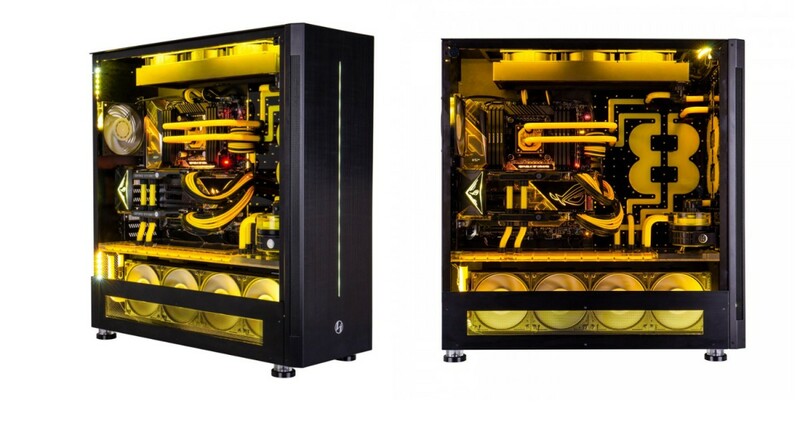 Overclockers UK is ready to start selling its 8Pack Polaris MK2 PC, which is an extreme system that the company has unveiled during the Computex 2018. The components are installed inside the full-tower Lian LI PC-V3000 and it comes with a huge custom watercooling setup. The system is based on a X299 setup featuring an Intel Core i9-7920X processor overclocked to 4.7 GHz and sitting on an ASUS Rampage VI Extreme motherboard. Apart from that there is 64GB of DDR4-3200 T-Force 8Pack Dark PRO memory. In the graphics department we find two ASUS ROG Strix GTX 1080 Ti graphics cards in two-way SLI. Regarding storage, Overclockers UK is using a Samsung 960 PRO 1TB NVMe SSD, one Samsung 850 EVO SSD and a 5TB WD Red Pro HDD. Polaris MK2 is powered by a SilverStone Strider ST1500 power supply placed in the base of the case that is a so called super-tower. In order to cool the system, OCUK is using two different loops with several radiators. According to OCUK, this particular setup costs £13'000 GBP.